I try to use materials in my designs which are not normally used for jewellery, and are used for very different purposes: like steel, insulation material and cotton. By using these materials for jewellery, the material itself obtains a completely different value. For example: unravelling cotton thread and translating this into steel cable gives me inspiration for completely different pieces of jewellery. I normally use primary colours for my work. This is compatible with the simplicity of my designs. 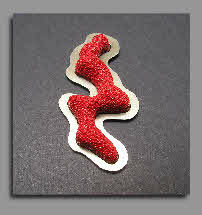 My work has a sculptural feel to it, so that a piece can function as an object if it isn’t worn as a peace of jewellery.